I love curls! But I don’t love all the fuss and nonsense that comes with getting them perfect. There are so many rules and precautions that sometimes I would just rather not style my hair. That was until I decided to take my time and find the best hair dryer for curly hair. This cut down the steps of my styling process drastically and left me with healthier hair that didn’t need as much work. Ready to find out how to find a hair dryer for curly hair that won’t ruin your good hair day? This dryer has 1800 watts and ionic technology that gives you complete control over your style. The ceramic will help you prevent heat damage, even if you forget to use a heat protectant spray. I loved the volume lift attachment that came with it. Even without product, I had a ton of extra volume after each use, which made my curls that much more bouncy. I definitely notice a difference on the days I don’t use this hair dryer. My curls don’t seem to be very perky and I just don’t feel like they’re as smooth as they could be, either. Luckily, my hair dries super fast when I use the Conair Curl Fusion, so it’s easy to build into my morning routine. If you’re looking for a fast way to get runway-ready curls, this is the hair dryer for you. I loved the look and style of the Xtava. It’s sleek and has a futuristic vibe that looks great in my bathroom. 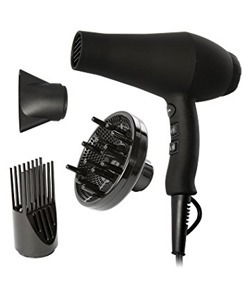 This hair dryer has a salon-grade motor and advanced ionic technology, which is a necessity for curly-haired girls. It has two heat settings and two speed settings, along with a precision nozzle that helps you direct the perfect amount of heat only where you need it. This is great for days when you don’t wash your hair but just spray it with a little dry shampoo and product. 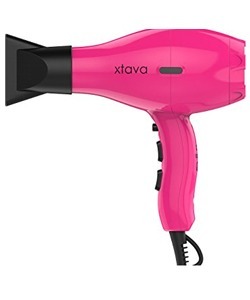 My favorite feature of the Xtava hair dryer was its cool shot button. I used it to lock in the perfect curl and it always lasted all day. Even if your hair is long, you’ll be in and out of your bathroom in no time with this dryer, and your curls will look amazing. This hair dryer was made for both curly and wavy hair. If you’re not sure if you need a hair dryer for curly hair or not, give this one a try. It’s made for even the slightest amount of curl and can really give you the volume and boost in curls you’re after. You’ll love the softer and shinier curls this hair dryer can produce, along with the fantastic way it eliminates frizz. It has a unique hand-shaped diffuser that delivers 360-degree airflow as it gently dries curls and leaves them looking amazing. My sister has just barely curly hair, but when she uses the Devacurl, her hair is suddenly bouncy, shiny and full of volume. I’ve always been known as the one with curly hair, but when she uses this dryer, it’s hard to tell which of us has curlier locks. 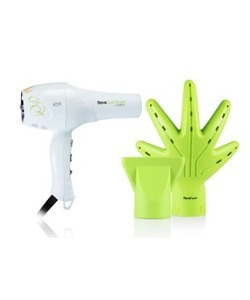 This blow dryer looks like it belongs in a salon, but the price says otherwise. It’s definitely a contender for the best blow dryer for curly hair. It features a sleek design with two speeds and an impressive three-heat setting that give you complete control over your drying experience. It features tourmaline-infused ceramic that speeds up drying time without being too damaging, while also reducing static and improving moisture levels. This hair dryer also has ionic technology, which creates a whole bunch of negative ions that break down water molecules. This helps to dry your hair faster while sealing in moisture. Just make sure that you don’t over-dry your hair, which cancels out the effects of the ionic technology. Need the best hair dryer for curly hair that does it all, and then some? 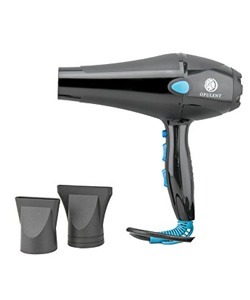 This one has plenty of attachments, including the best diffuser attachment for curly hair, and settings to give you everything you’ve ever wanted from a hair dryer. It has a lightweight and ergonomic design, along with a dual filtration system and a quiet but powerful motor. It also has negative ion technology, a necessity for getting the perfect curls that aren’t dry or brittle. I love the three heat settings and two speed settings on this model. It also features the cool shot element for freezing my curl, giving me the perfect look every time I use it. It comes with a nozzle for heat concentration, along with what I think is the best diffuser for curly hair, and even a comb pick that allows you to volumize while you dry. I feel like this dryer practically cuts my drying time in half. It saves me styling time too, because of the different attachments and settings. 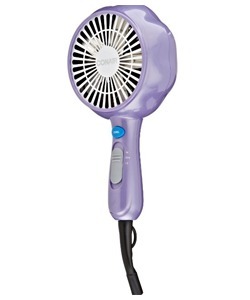 This is my go-to hair dryer for days when I need a little extra confidence in my hair. Is It Bad to Blow Dry Hair Every Day? It’s not the actual act of blow drying your hair every day that makes it bad for your hair. The problem is that most of us don’t take the proper precautions to protect our hair, or we’re using styling products that aren’t made with hair health in mind. This leads to dry hair that’s more susceptible to damage. Damaged hair can look unattractive, be hard to style, and even lead to excessive hair shedding and loss. If you need to blow dry your hair on a daily basis, you must take the proper precautions and use the best blow dryer for your needs. Not all hair dryers are created equal. 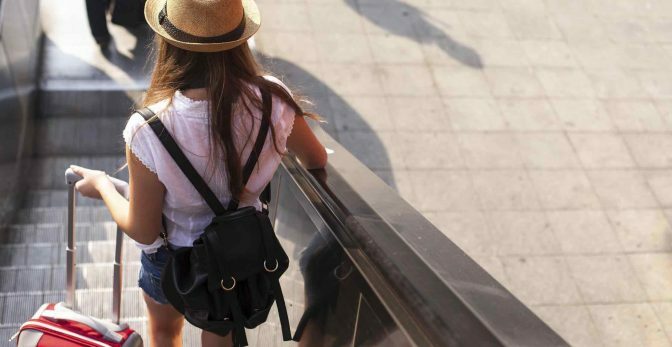 Some are ideal for long and straight hair, while others are made for us curly-haired girls. If you’re simply basing your hair dryer purchase on color and price, you’re probably not using one that’s made for you. There are a few different things you should consider when finding the best hair dryer for curly hair. First, you’ll want to decide on wattage. The higher the wattage, the harder and faster the fan and motor will work, which will dry your hair quicker. You’ll also want to decide if you want adjustable temperatures, which can help you to avoid heat damage. You might also want to consider dryers that offer multiple speed settings, especially if your hair is on the finer side. If you really have no idea which blow dryer would be best for your type of curls, take a look at my reviews in just a moment. But first, I want to talk about how to blow dry curly hair so that you’re not damaging it or not getting everything out of your hair dryer. If you have curly hair, you know the challenge that comes along with blow drying it. There are so many precautions we have to take to keep our hair not just healthy, but also bouncy and curly. Your hair should be about half-way dry before you use the blow dryer. If it’s still soaking wet, you’re sure to be causing damage, no matter how careful you are. Either use a towel or even just your hand to get rid of excess moisture and let the air take over for a bit. 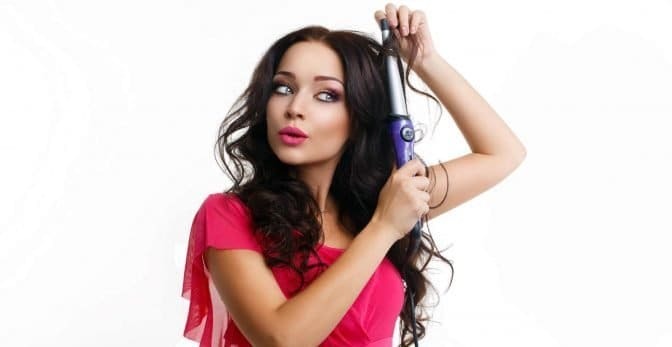 Once your hair begins to dry, it shouldn’t be much longer before you can hit it with the hair dryer. This is a must for us curly-haired girls. If you don’t have a diffuser that came with your blow dryer, you can always buy one separately. Plenty of hair dryers do come with diffusers, so with a little research you can find the best diffuser for curly hair. Try not to move your hair dryer while it’s on. Focus it on one section of hair and blow it dry. Turn the hair dryer off before you move on to another section. This will get your hair dry but won’t cause too much damage. You should stop blow drying your curls when they’re about 90% dry. This will keep you from drying out your strands. A few scrunches with your hand should complete the job. You can also use a hot air brush to touch up any damp spots. Also, make sure that you’re always using a heat protectant spray and use enough to cover all sides of your hair. 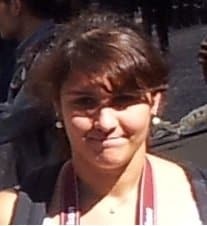 You can also look into haircuts for girls with curly hair and pick one that best suits your face shape and hair color. Sometimes the right cut can make a huge difference. No matter your curl type, you want to make sure that you’re using a ceramic hair dryer that uses infrared heat and high wattage. This will help to dry hair from the inside out in record time so that you can prevent frying, damage, and frizz. Thick and unruly curls can look absolutely amazing, but it sure is difficult to let them dry! You’ll want to find a hair dryer with about 2000 watts. The faster you can dry your hair, the less time there is for it to be damaged. If your hair is unruly, you’ll definitely want to make sure that you’re using the best hair dryer for curly hair with a diffuser to minimize frizziness. When you have long hair, it will always take a long time to dry your hair. While you’ll want to look for a dryer with high wattage, and a diffuser to keep things looking healthy and great, you’ll also want to keep weight in mind. It seems silly but if you’ve narrowed your choices down to two hair dryers that seem to be just about the same, go with the lighter one. Your arm will thank you! Do your curls do whatever they want, when they want? Then you need a hair dryer that lets you control ionic settings. This will let you either dry your hair so that it’s smooth and easy to straighten or let your curls puff up, giving you volume that’s sure to make everyone else in the room jealous. There’s nothing that ruins my day faster than frizzy curls. That’s why you need a hair dryer that can stop them from happening in the first place. Look for one that has high wattage, ionic technology, and temperature control to give you the freedom to adjust your settings as needed, depending on the weather. Tight curls are stunning but need a bit more care. A combo of tourmaline and ceramic will help to dry your hair quickly without using too much heat and causing damage. Be sure that you choose one with a diffuser that can keep up, leaving your curls springy and even. Having curly hair can be a bit of a battle sometimes. But once you find the best hair dryer for curly hair, you can easily make your hair smoother, curlier, and healthier. From there, it becomes much easier to dry your hair, head out the door, and enjoy the compliments that come rolling in. If it’s time for a new blow dryer, get one that was made for you and your curls. It’s a decision you’ll never regret.